The Cobblers have signed Northern Ireland international Ryan McGivern on a short-term contract. The central defender has joined the club until January, having been without a club since leaving Town’s Sky Bet League One rivals Shrewsbury Town in August. The 27-year-old, who can operate as a left-sided centre-half or as a left back, began his career at Manchester City having come through the youth system at the Etihad Stadium. McGivern only made one substiute appearance in his five years with City, but he was sent out for several loan spells in that time, playing for Morecambe, Leicester City, Walsall, Crystal Palace, Bristol City and Hibernian, before signing for the Edinburgh side on a free transfer in the summer of 2013. In all, he spent two full seasons at Easter Road, before heading south to sign for Port Vale. 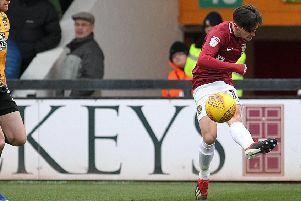 After two seasons at Vale Park, where he played under former Cobblers boss Rob Page, he made another free transfer move to Shrewsbury Town in the summer of 2016, but he failed to hold down a regular place in the team, and left the club in August. He has been a free agent ever since, and after training with the Cobblers has been given a chance to resurrect his career at Sixfields. Newry-born McGivern made his international debut as an 18-year-old in 2008, and has gone on to make 24 appearances for Northern Ireland, the most recent of which was as a half-time substitute in a 3-0 friendly defeat to Croatia in November, 2016. In all, McGivern has made 197 starts and 20 substitute appearances in his senior career, scoring two goals.